Finding a physician doesn't have to be a pain. With three hospitals and over 20 clinics across the area, our physicians are ready to help you stay well. We have several ways for you to find a physician to meet your health care needs. 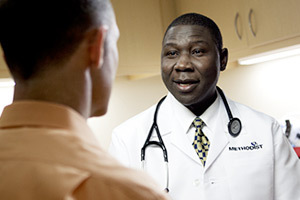 From everyday needs to life-changing events, our primary care providers help you stay healthy. Find a pediatrician, family medicine doctor, internal medicine doctor or obstetrician/gynecologist convenient to you. Our physician referral service will help you select a doctor based on your preferences. Whether you are new to our clinics, or already a patient, you can request an appointment online 24 hours a day. We will contact you to confirm your time. You can search by location, specialty, gender and more. View the profile of the physician and watch a video to learn more about the doctor. Browse our physician directory now.